This weeks blog question brought to mind issues with ownership and movies. Similar to the thrill of purchasing a physical book, I would get excited when I went to Blockbuster and browsed their clearance DVD collection on Friday nights. I would spend more time deciding on which movies to buy then I did watching them. After a few years, I have quite a large collection of DVDs that I can take with me anywhere I go and that I can use across devices. 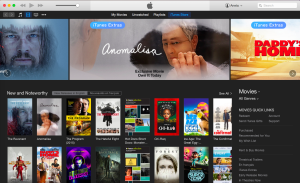 With the introduction of online movie purchasing options through iTunes and similar services, I purchase or rent my movies through these services instead of the physical DVD. Although the online shopping experience makes purchasing movies easier and doesn’t require me to leave my house, it has its draw backs. The main one being that I have experienced issues with not having access to content across devices. With a DVD, you can play in through your DVD player or laptop by simply inserting the disk. As long as you have the physical disk, you will have access to the content (assuming the disk is in good condition). With movies purchased through iTunes, you need to be signed into you iTunes account on the device and should have access to all of your purchases. However, I have previously purchased a movie on a laptop and when I tried to view it though iTunes on Apple TV, the movie was not present in my iTunes account on my AppleTv. Recall thing this experience made me really consider the concept of ownership in a world where everything is online or in the cloud and we no longer need to purchase physical objects. It brings to mind questions about how we can own something that we do not physically have or see and whether we can really consider this a true concept of ownership. Considering the way in which we purchase movies online, are we being granted ownership or access to the movie? I think it is the latter, but I would love to hear what you think. The feeling of really owning when it exists in a virtual form is something I personally have struggled a bit with. Mostly this is due to the fact that I used to get regular viruses on my computer- even with protective software and never really downloading things it just always seemed to happen and I lost so many movies and songs this way! As I could never get them back it made me feel as though I never really owned it compared to the tangible feel of a dvd or CD. Now while I have had to overcome this feeling with iTunes I feel like we are moving into a world where not tangibly owning things will be the norm and the idea of tangibly owning media like movies, CDs and video games will become a thing of the past. That as you said access will be the new ownership. I guess you will own your chance at access? Thanks for your comment! I feel like loosing digital content or access to digital content is a struggle that many people have faced in the past and one that we will continue with as we move forward into a continually more digital world. I like the way you phrased your view, that we own a chance at access. This statement really encompasses how I also view the future of the concept of ownership as we keep heading down the path to a more digital world.